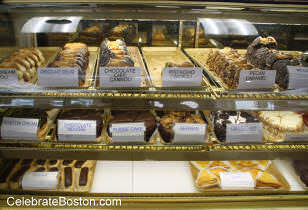 If you're in the North End, one of the things you should try not to miss is Mike's Pastry. Whether you're into sweets or not, this establishment, with thousands of positive online reviews, is definitely something to experience. With over fifty years of baking expertise, Mike specifically hand picks only the top notch, freshest ingredients for his Italian-American pastries. They also customize cakes for the design you have in mind, which is pretty neat. If you plan to visit Mike's, be prepared to wait in line because the place is usually packed, like other local establishments that simply ooze great quality and renown. Firstly, they have a line of traditional Italian pastries. The Cannolo features different options for filling including cheese, chocolate and cream, and other chocolate and cheesecake varieties. The filling is wrapped in a crunchy shell studded with chocolate chips. Other desserts in this category are the Pasticiotto, a small cream cheese pie, the Sfogliatella, a lobster tail-shaped baked pastry, and Tarallo, a crusty baked cookie, among others. Mike's has a good variety of traditional Italian and American cakes. Their Rum Cake is extremely popular. Other goodies include the Boston Creme, Gold Cake, Cassata Siciliana, Chocolate Mousse, Strawberry and Chocolate cheesecakes, and Tiramisu. As mentioned earlier, they are willing to customize and design a cake according to your specifications, a quick look at some of their samples reveals cake designs in the form of a basketball jersey, a caricature of a Dalmatian, a turkey-shaped cake, and even a dinosaur invitation! They also serve a myriad of other pastries like the Biscotti, cookies, pies, gelati (ice cream) and marzipan. Popularly, Biscotti refers to a whole variety of Italian cookies but these are also known as best paired with coffee. There are hard and soft varieties, with different flavors ranging from dark dough, light dough, and chocolate and almond. As for traditional cookies, well, they have 50 varieties and counting! You name it, and they've probably got it in cookie form. Different shapes, sizes and even colors. As for their pies, one stand out is Mike's famous Ricotta Pie. You need just get a taste of this pie to understand how it earned its fame. Italian ice cream, or Gelato is also available. Italian ice cream is tons smoother and creamier in terms of texture than regular ice cream, which makes this section mouth watering. They have all the classic flavors like chocolate, pistachio, strawberry, fudge and many others. The front lobby of this establishment is basically a small cafe and can seat up to 50 peopley. To summarize the coffee selections and quality of Mike's—you can't go wrong with authentic Italian coffee in you are a coffee lover. All of the coffee names and varieties are Italian words! That being said, Mike's is extremely authentic. Online customer reviews for Mike's have been positive overall. They've had thousands of reviews, mostly positive, and mostly because their customers are so delighted and pleased that they can't help but share and shout out their happiness with Mike's. You've probably experienced it once or twice in your life when that first spoonful of dessert in your mouth suddenly melt all your troubles away and for a moment it was pure bliss, until you got the urge to get another spoonful. Well, most customers have different variations of this experience when they talk about the different desserts at Mike's Pastry. Of note, most customers mention the Cannoli as THE dessert to have here. If you're going to Mike's Pastry only once, that's what to order. The whole experience will probably makes up for the crowds and the long queue, which are really just a testament to this great place.